Remember that email address you set up at school? The one that mentioned your favourite band or most hated subject at school, normally with several numbers after it? Well, it’s time to get rid of this. Not only does it look slightly unprofessional, but some filtering systems may also think it’s spam and could class it among the “I need your help, please send money” correspondence. Ideally you need to have an email address which is just your name. It’ll make you stand out and the university won’t think you’re a teenager trying your luck. The hobbies section can be a difficult one to fill in. And while your enjoyment of Harry Potter books and long walks in the park might impress people on dating websites, it’s sadly not something the admissions department are particularly interested in. If possible, try and include hobbies that emphasise your passion for the subject you’re applying for – and if you really must mention your love of watching Netflix, make sure you keep it brief. 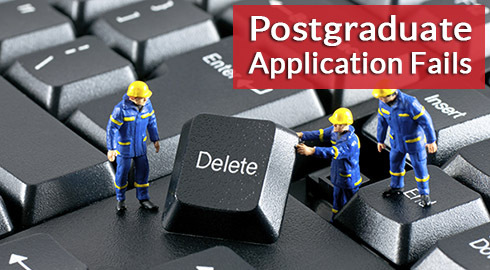 Because you’re applying for a postgraduate course, you’ve probably got quite a lot of experience. Whether it’s academic- or work experience-related, though, make sure you keep it relevant. Admissions don’t need to know about the Poundland job you held down while studying your A Levels, or your SATS results from Year 9. There are some words that universities will read again, and again, and again. It ends up feeling like a never-ending Groundhog Day for them, so make sure you delete potential clichéd words and phrases that don’t mean anything. If it makes you sound like David Brent, then get rid of it. You should also make sure any generalised claims are backed up with evidence. For example, universities need to know you’re a team player because you led a group presentation, or they may assume you could just be very good at playing Articulate. Remove ANY negative words. If you don’t believe in your amazing talents and abilities, then why should the course provider? Although you don’t want to sound beaten before you’ve even got an interview, you also don’t want to exaggerate so much that universities don’t believe a single word you say. Keep it confident and steer clear of cocky, basically. Even with a dozen re-readings of your application, it’s easy to miss spelling and grammatical mistakes. When you’ve finished, make sure you use everyone’s favourite saviour, Spellcheck (seriously, whoever invented that should be knighted), and get a friend/parent/lecturer to give it a read through as well, if possible. Congratulations, you’re application has literally knocked the socks off the admissions team and they’re desperate to offer you a place on the spot. But whenever they ring you the local takeaway answers, and every email they send bounces back, so they offer it to someone else instead. Nightmare scenario, right? Make sure your contact information doesn’t include old phone numbers, email accounts you no longer use, or the address of the house you lived in during second year. It’s an easy mistake to make that could end up costing you a place. References are an often overlooked part of your application, but they’re also the best way to show admissions how awesome you are in a non-biased way and without blowing your own trumpet, as it were. So make sure you get someone professional, and preferably not related to you (of course Auntie Sue is going to say you’re amazing). Similarly, delete any references that might not take it seriously – your best mate who loves to pull pranks on you, for example, is a definite no-no. - Should you do a Masters or an Internship? - Should You Stay at the Same University for Your Postgraduate Degree?